One of the most troubling situations a shop technician faces is not being able to find critical service information needed to properly diagnose and repair a vehicle. This could be anything from torque specs and bolt- tightening sequence to wiring schematics or even clock programing instructions. In the A/C world, it’s most frustrating when a technician can’t locate capacity information for a system they’re working on, and when they’ve tried everything they can at their shop, they often reach out to tech support specialists at their parts’ suppliers (and their membership organizations like MACS) to get some help. But sometimes we run across a situation where no matter how much we search, and no matter how many people we ask, we just can’t seem to find definitive answers to sometimes basic questions, such as how much oil is supposed to be in a particular system. Read the whole article. 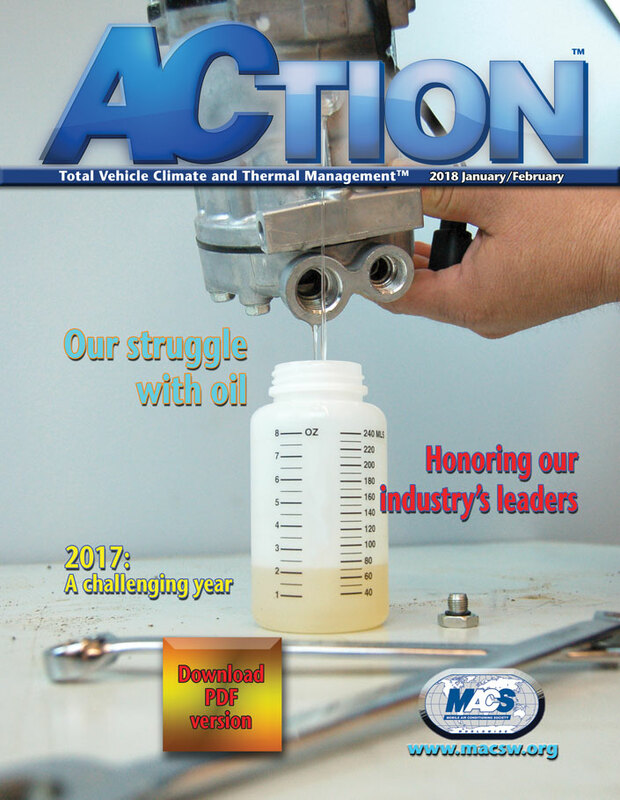 Download the January-February 2018 issue of ACTION. This entry was posted in #1234yf, ACtion Magazine, MACS Member, MACS Training Event, Mobile Air Conditioning, Refrigerants and tagged #compressoroil, 1234yf, mobile air conditioning, professional service, refrigerant, Section 609 Certification. Bookmark the permalink.